Even without a dual camera, the HTC U11+ attempts to outperform the image quality of its biggest rivals: Apple and Samsung. But there is still hope for HTC despite the competition. 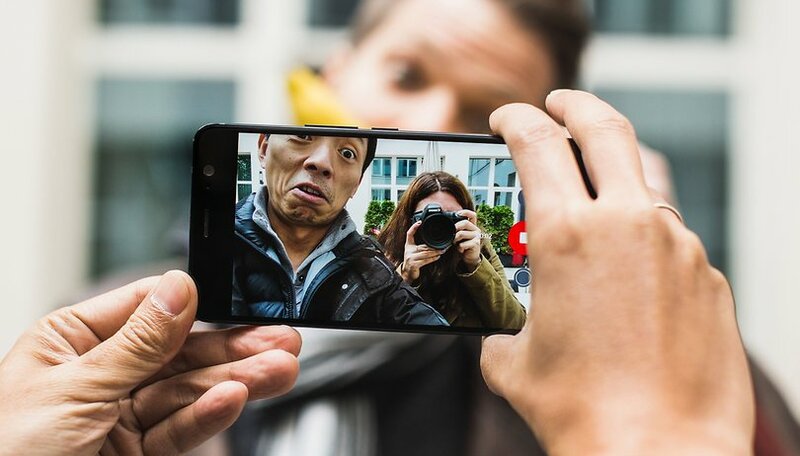 The U11+ uses the same image sensor as in the Pixel 2 smartphones, and in addition, HTC list “Ultrapixel 3”, “Ultraspeed Autofocus” and “HDR Boost” on the specifications, but what do these terms actually mean? What camera is the HTC U11+ packing? The smartphone scores well on the hardware side. HTC calls its camera feature Ultrapixel 3, and the image sensor named IMX362, was developed by Sony. It has a 12 megapixel resolution, and the pixels on the 1 / 2.55-inch chip are relatively large at 1.4 microns. Large pixels are better because with more surface area, the sensor collects more light, and therefore improves the photo quality. With an aperture of F1.7, the U11+ camera takes photos that are quite bright, and if slower shutter speeds are required in low light conditions, an optical image stabilizer reduces the camera shake. In addition, a dual LED flash is available for poor lighting conditions, which adapts its color temperature depending on the environment. If you're a fan of artificial Bokeh effects, you might be disappointed. HTC does not use a second camera to blur the background using a depth map, nor does it use the Sony sensor's dual-pixel autofocus for this function. For example, Google does the latter for Pixel 2 and Pixel 2 XL, which use the same chip. With the U11+, a noticeable depth of field effect can only be achieved with macro photos. Finally, on the front of the phone is an 8-megapixel picture for selfies. Here, there is an F2.0 aperture and a diagonal image angle of about 85 degrees. Converted to 35-mm equivalent, this corresponds to about 24 millimeters and is slightly wider than the main camera. In contrast to the 12-megapixel camera on the back, the front camera doesn't have autofocus. Considering it has a very small image sensor, however, the autofocus isn't necessary: With an optical focal length of 2.51 millimeters, almost everything is sharp; after around 40-50 centimetres. When transferring photos from the HTC U11+ to your computer, the photo quality is excellent. The JPEG files are up to 7.5MB for detailed images, and HTC has chosen a 90% compression level, enabling the photos to maintain detail, in smaller objects such as leaves, for example. This is what some competitors usually fall short on with cameras. The colors are also impressive, with a strong contrast as well as being natural-looking. Automatic white balance functions well and skin tones are also accurate. I would recommend this camera without a date for taking photos in the daytime. Unfortunately, as with many smartphone cameras, the same cannot be said for low light conditions. In poor lighting, the automatic white balance doesn’t work quite as well, and the photos may have a yellowish or greenish tone. Having said that, the image quality in low light is still OK. Noise levels are even kept under control even in the four-digit ISO range. HTC's camera app enables you to control the color temperature with a slider, so you can manually adjust the white balance and correct the color for more accuracy. Incandescent light for example, equals approximately 2,700 Kelvin. A downside to the HTC U11+ is its dynamic performance. The automatic HDR, otherwise known as HDR Boost by the manufacturer, simply does not reach the results that Google does with the current pixel generation and HDR+. Although the dynamic range is noticeably improved with activated HDR boost, there are some problems with halos, ghost images and the typically pale HDR look. I often disabled the HDR mode. However, in the case of high-contrast scenes, overexposed areas of the image are often visible, which makes it obvious that the photo was taken with a smartphone. If you take the time to use the RAW format in Pro mode and process the files afterwards, you will notice an improvement in the dynamic range. The selfie camera is noticeably slimmed down compared to the main camera. With an 8-megapixel sensor, it is clearly smaller and not as high quality as the rear camera in terms of resolution and surface area. Although HTC does not reveal the chip itself, it is possible to assume the sensor format is 1/3.6 to 1/4 inches from the specification lists 85 degree field of view and the real focal length of 2.51 millimeters in the EXIF data. First of all, the good news is that the front camera benefits from image processing algorithms and delivers really beautiful colours in good lighting conditions. However, the smaller sensor surface area is noticeable in the dynamic range, so that only halfway high-contrast subjects quickly lead to overexposed image areas. Unfortunately, the HDR mode can only be set to "Automatic" or "Off" in selfie mode - forcing is only possible with the main camera. As well as that, HTC offers the obligatory make-up function in selfie mode. There is no way to adjust the intensity of the effect. On the positive side, however, the beauty filter does look quite natural compared to the exaggerated effects that some competitors' smartphones have. The above information is also relevant to the video quality: during the day, the clips recorded are detailed with beautiful colors, and the image stabilizer works impressively well and stabilizes even when walking. However, over-exposed areas of the image are often noticeable. The UTC U11+ does not currently support HDR video. In low light environments, the noise increases and the automatic white balance is not as reliable. Unfortunately, there is no Pro-Video mode that allows for more detailed settings. Finally, the HTC U11+ offers a number of special functions. Including the Hyperlapse function, which generates image-stabilized time-lapse images, providing appealing results from images taken on walks or bicycle rides, for example. Unfortunately, the resolution here is limited to 1,280 x 720 pixels, and the images are somewhat lacking in detail and show excessive micro-contrast. Furthermore, there is also a slow motion function that brings the action in front of the camera onto the digital film at a much slower rate of 120 frames per second. A lot of light is required for good pictures, otherwise you'll see noise. However, the resolution of the U11+ is maintained at Full HD, and detail reproduction in daylight is good. Since the release of the U11, HTC has given its camera app a new look, which I enjoyed using. The app is simply structured and is not overloaded with functions, and although there are only a small number of them, you probably won't need much more for average use. The fast autofocus, which HTC calls "UltraSpeed", is also a feature worth mentioning. The dual-pixel autofocus of the built-in Sony sensor comes into play here Out of focus photos may be a common problem with smartphone cameras, but during my review, this didn't happen once. The HTC U11+ once again shows how important the software is. Android itself is available for all manufacturers, and the same applies to Sony's image sensors. The Sony sensor in particular is a solid basis, and the U11+ does conjure up really beautiful photos using this sensor. But where software makes the biggest difference, the difference between HTC and the toughest competitors becomes clear. Google has meanwhile pulled back on the development of the camera app for Android and pushed the responsibility onto the smartphone manufacturers. In the age of computational photography, this is not good news for "the little ones". It is becoming increasingly difficult to compete against Samsung, Apple and Google. The difference is not big yet - but it will certainly not be any easier in the next few years. I can't agree with you when you say the gap will be larger in the next years. you don't know that, so you can't conclude that. i've htc 10 and htc u11 and i can say the jump on quality was huge from 10 to 11. if on 10 they where below samsung 7, on u11 they had better results than samsung 8. they are doing a great job on camera department, and i take phones from my u11 every day and i'm still amazed with the quality of the photos. i installed google camera app, and i agree that in low light hdr+ from google is superior, and is faster to take pictures also. but on 99% of the photos i take (i mostly take in daylight), i prefer the htc app. photos are a little bit more natural. almost all bad photos you are complaining about the htc u11+, they are just that, bad photos you should not take in the first place. who takes photos against the sun? really? your review is almost an how not to take photos on any device not only on htc u11+. and if you prefer google software...well, you can have it also. if you take more picture at night or with bad contrasts, or your just bad taking photos...well no phone will save you from that...my girlfriend takes 10x worst pictures than me with the same phone, maybe the fault is not the phone...just maybe.